Devoted to Free Thought and the Science of Life. San Francisco, CA. Publisher: Kerns & Chaney. Editor: Prof. W.H. Chaney, associate editor Mrs. Louise M. Kerns. 1/1, May 16, 1875. $2.00 a year, 16 pp. In its initial issue, the journal stated its intention of publishing regularly for three months to gauge its reception, but there is no indication that it lasted that long, and the content is unprepossessing. It had a strong reform tendency, with anti-clerical and especially anti-Romanism elements, and a Medical Department that promoted the publishers' dietary and health boarding house ($10-$30 a week, with treatments). As was not unusual in reform circles, the journal rained vituperation on erring fellow reformers. "[Victoria C.] Woodhull is an uneducated woman, incapable of writing a simple sentence grammatically. Tennie is still more ignorant, while Mrs. Broeker, the sister who died, assured me that she could not write her name. I have a letter from 'Dr. Claflin,' a brother, misspelled and ungrammatical in the extreme," etc. The associate editor, Mrs. Kerns, was a newly minted medium, enthusiastic to spread the word, especially to grieving mothers: "She wants something more than faith—she asks for proof. And it is my mission to give, from the spirits themselves, direct proof of a higher life; assurances that they are not dead, but gone before—and gone to return whenever surrounding circumstances are favorable." William Henry Chaney (1821-1903) was born in Maine and turned his hand to preaching, then the United States Navy, then the law (in Virginia), and then to spiritualism (he edited the Spiritual Age of Boston in 1859). Asked by a publisher to write a criticism of astrology, he became a convert to it. In 1875 he began a club in San Francisco called The Philomatheans, devoted to astrology and astro-theology, with this journal as its organ. 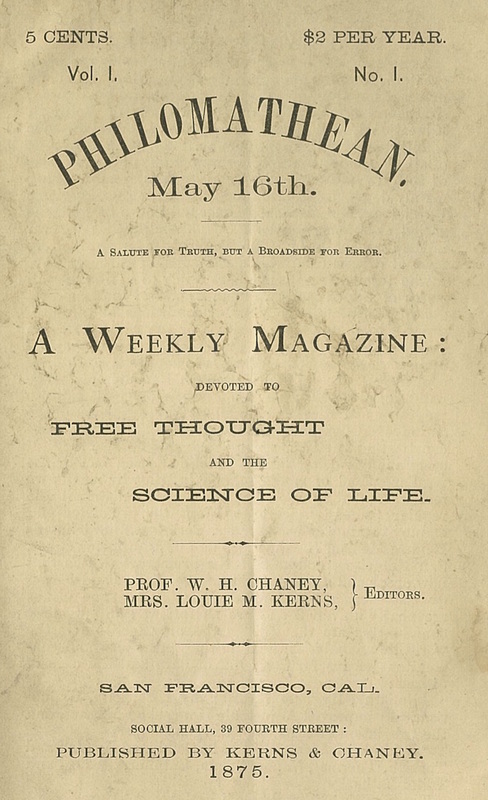 Julia Schlesinger notes that "in May, 1875, The Philomathean , a pamphlet-shaped weekly, was started by Prof. W. H. Chaney, which also passed away after a brief existence." Workers in the Vineyard: A Review of the Progress of Spiritualism, Biographical Sketches, Lectures, Essays and Poems (San Francisco, CA, 1896). W.N. Slocum (of Common Sense) is more trenchant. The journal quickly expired, he asserted, because Chaney had concluded that Common Sense needed more astrology and started the Philomathean to remedy the lack. "But the fact was Common Sense had too much instead of too little of the 'science' of Astrology. That was a part of the handicap before referred to." W.N. Slocum, "Progress of Spiritualism in California," Carrier Dove 4/1 (January 1887): 25-9. Chaney has a certain notoriety in another context, since he seems to have been the father of Jack London. See "William Henry Chaney," online at The World of Jack London, jacklondons.net/Family /WilliamChaney.html. When Flora Wellman, London's mother and Chaney's wife, attempted suicide in June 1875, the San Francisco Chronicle discussed Chaney's journal: "He practiced astrology, calculated horoscopes for a consideration, lectured on chemistry and astronomy, blasphemed the Christian religion, published a journal of hybrid doctrines, called the Philomathean, and pretended to calculate "cheap nativities" on the transit of planets for $10 each, for all of which he obtained but slender pecuniary recompense. Astrological knowledge is, of course, highly valuable, but the supply in San Francisco seems to be slightly in excess of the demand, and no matter how much Professor Chaney lectured, scattered circulars, watched the movements of the planets, and cast nativities, his exchequer continued painfully bare and his larder nearly empty." Chaney is also said to have been a student of Olney H. Richmond (on whom see Star of the Magi and The Progressive Thinker) and to have become Grand Magea of Richmond's Order of the Magi in Los Angeles in later years. An incomplete note on his life and astrological work can be found in "Prof. W.H. Chaney," The Horoscope 1/8 (April 1903). Chaney also edited the Spiritual Age, Common Sense, Chaney's Annual, and World of Mystery. Amherst College.